Kansas Governor Laura Kelly delivering her first state of the state address. Chairman Troy Waymaster opened the appropriations committee with a round-robin introduction of members, legislative staffers and his personal staffers. Waymaster called his committee the “best committee in the House” because this committee will “have its hand on everything the state government does.” If introductions by the dedicated staff focusing of fiscal analysts and revisors is any indication, Waymaster is probably right. Following introductions, an agent from the Kansas Department of Revenue, gave a summary of Kansas revenue estimates and forecasts. In summary, while FY 2018 ended better than forecast, several state and national factors could negatively impact FY 2019 estimates. The revenue official continued to describe the forecast as a “mixed bag” of good and bad indicators as we move into an uncertain economic future. Chairman Waymaster noted, that agriculture is KS leading economic driver and Pres. Trump’s shutdown is impacting KS agriculture due to frozen stimulus payments to farmers which came as a result of the negative impact from Pres. Trump’s tariffs. The revenue official agreed that negative impacts upon agriculture could certainly impact the state economy and consequently the revenue estimates. What remains very clear, is that the FY 2019 approved state budget leaves an ending balance of $905 million. With this money on hand, the state is in a position to fully fund public schools according to the Kansas Constitution for the first time in almost a decade. There is also enough to begin to address some of the myriad other budget issues left behind by the Brownback / Colyer administration, like KPERS, highways, and social services. Today, many of those reps who supported the Brownback agenda that created the budget holes we’re dealing with now, are pushing not for filling those holes, but instead warning against the threat of a bleak national economy on the horizon and the need to hold onto our reserves. We call on our representatives to take the final step in fully funding public schools according to the constitution by using the surplus to account for inflation adjustments in the ‘out-years’ of the funding formula. Doing so now while the money is available would end litigation and more importantly, give our students access to a fully funded and constitutional K-12 experience. The Senate Tax Committee met again today to continue discussion of SB 13 with the Kansas Chamber of Commerce bringing in more information and an tax expert from the Seaboard corporation to explain the GILTI and Repatriation provisions of the Trump/Ryan tax reform and their impact on Kansas taxes. We can assure you that these provisions have no direct impact on individuals but instead impact what corporations pay in income taxes and they both deal with overseas earnings. It’s best to let the experts explain these provisions to you, so click here to get an understandable explanation of GILTI. Then click here to get an understandable explanation of repatriation. They are both short reads and might be illuminating. The House Education Committee met for the first time today simply to get to know each other and to review their committee rules. There are plenty of new faces this year including many freshman. The new freshmen are Dave Benson (R-Overland Park), Rene Erickson (R-Wichita), Cheryl Helmer (R-Mulvane), Mark Samsel (R-Wellsville), Adam Thomas (R-Olathe), and Rui Xu (D-Westwood). John Toplikar (R-Olathe) is technically a freshman now although he served a number of years ago in the Legislature. New to the Committee are Stephanie Clayton (D-Overland Park) and Steven Johnson (R-Assaria). Rounding out the committee are Steve Huebert (R-Wichita), Brenda Dietrich (R-Topeka), Jim Ward (D-Wichita), Adam Smith (R-Weskan), Jim Karleskint (R-Tonganoxie), Mark Schreiber (R-El Dorado), Jane Vickrey (R-Lousiburg), and Jerry Stogsdill (D-Prairie Village). The K-12 Budget Committee today received the same school finance overview that was presented to the Senate Education Committee yesterday. 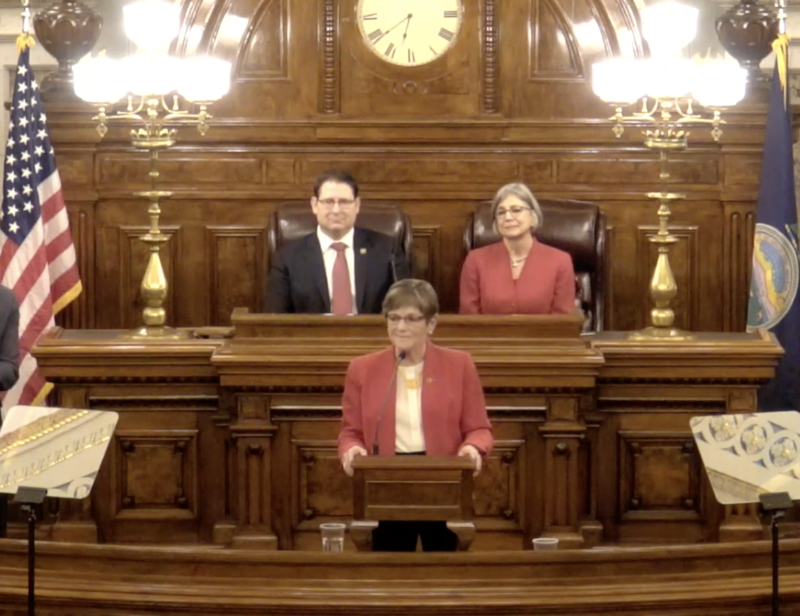 In her first state of the state address, Governor Laura Kelly laid our three priorities for Kansas. We need to fund our schools and end the cycle of litigation; we need to expand Medicaid to help 150,000 Kansans get health insurance, to keep Kansas tax dollars in Kansas, and to preserve our rural communities; we need to overhaul and restore our failing foster care system. We’ll talk more about her speech after we review it more thoroughly, but in the meantime, you can read it by clicking here or watch it by clicking here.